TEG Dainty and Nice Events are excited to announce that attorneys Laura Nirider, Steven Drizin and David Rudolf from the Netflix series’ Making a Murderer and The Staircase will bring their popular speaking tour to New Zealand in 2019. Tickets go on sale Tuesday 29 January, 10am local time for the six-city tour. Laura Nirider & Steven Drizin from the Netflix smash docuseries Making A Murderer (lawyers for Brendan Dassey) and David Rudolf from The Staircase (lawyer for Michael Peterson) will join forces for a riveting night of “behind the scenes” insight into how police and prosecutors tipped the scales of justice in their efforts to convict Michael Peterson and Brendan Dassey. They will be taking questions from the audience with follow up discussion of the most important issues raised in these incredible true-crime documentaries. This evening is a must for any true crime fan. Making a Murderer follows the trials of Steven Avery and Brendan Dassey. Stephen Avery served 18 years in prison for the wrongful conviction of sexual assault and attempted murder of Penny Beerntsen. He was again charged in 2005 and convicted in 2007 for the murder of Teresa Halbach. Avery’s nephew, Brendan Dassey, was accused and convicted as an accessory in the murder. The discrepancies in the police work and judicial procedures in both cases have caused waves of concern and conversation about the justice system in America. 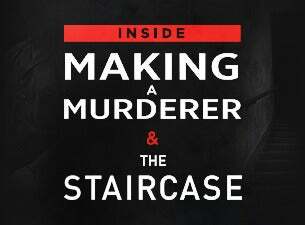 The Staircase documents the trial of Michael Peterson, who was convicted of murdering his wife Kathleen Peterson. Peterson was convicted in 2003 of beating his wife to death and sentenced to life in prison. Eight years later, he was released on house arrest after a judge found that the blood analyst who had provided essential evidence in the case against Peterson had given misleading and false testimony about the bloodstain evidence. Taken as a whole, the series paints a grim portrait of the criminal justice system. David Rudolf is one of the pre-eminent trial lawyers in the US, specializing in high-profile and complex criminal and civil rights cases. Mr. Rudolf has been listed for more than twenty-five years in the Best Lawyers in America and was one of only three criminal defense lawyers recently selected for the inaugural class of the North Carolina Lawyer Hall of Fame. In recent years, in addition to securing acquittals in two high-profile federal and state criminal trials, he has successfully represented individuals in civil litigation against law enforcement agencies arising from wrongful convictions. Rudolf has taught Trial Advocacy at the UNC School of Law and for the National Institute for Trial Advocacy, and Criminal Litigation at Duke University School of Law. He has also been recognized for his work with professional organizations, serving in various leadership positions in the ABA Criminal Justice Section, the National Association of Criminal Defense Lawyers and the North Carolina Academy of Trial Lawyers and Advocates for Justice. Most recently, he has received world-wide acclaim for his representation of Michael Peterson in The Staircase on Netflix. In September 2018 David was awarded the prestigious Trinity Praeses Elit Award, which recognizes individuals “who have advanced discourse in their line of work, and who have been a source of inspiration for young people everywhere’.